Stallone plays Henry "Razor" Sharp, a former boxer who retired to a humbler life as a welder in Pittsburgh after a long rivalry with De Niro's Billy "The Kid" McDonnen. Kid had beaten Razor the first time they met only to lose to Razor the second time. 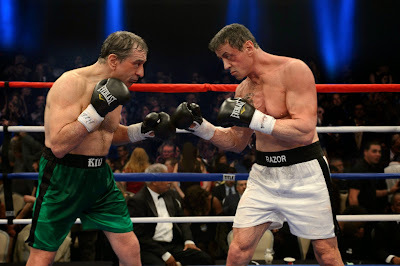 Razor's refusal to ever give him a rematch frustrates Kid, now a fat, well-off car dealer and nightclub owner (one of several callbacks to each of the stars' noteworthy roles as boxers). But hustling promoter Dante Slate (Kevin Hart) finds an angle that will let him turn this petty geriatric rivalry into the next great powerhouse fight match. Stallone capitalizes on his screen time with Kim Basinger, playing his former fiancée Sally, and Alan Arkin, as his cranky coach "Lightning," to give an above average look at a man who stubbornly continues to deprive himself of the people and sport he loves in order to stick it to his greatest enemy. And Stallone's performance isn't the only pleasure to be found in the minor Grudge Match. It's nice to see Basinger onscreen again after what seems like a longer time than the 3 years since her last film. Jon Bernthal—who so vividly played Jordan Belfort's friend Brad the way a young, live-wire De Niro might have in The Wolf of Wall Street—is perfectly cast as Kid's coach and newfound son. 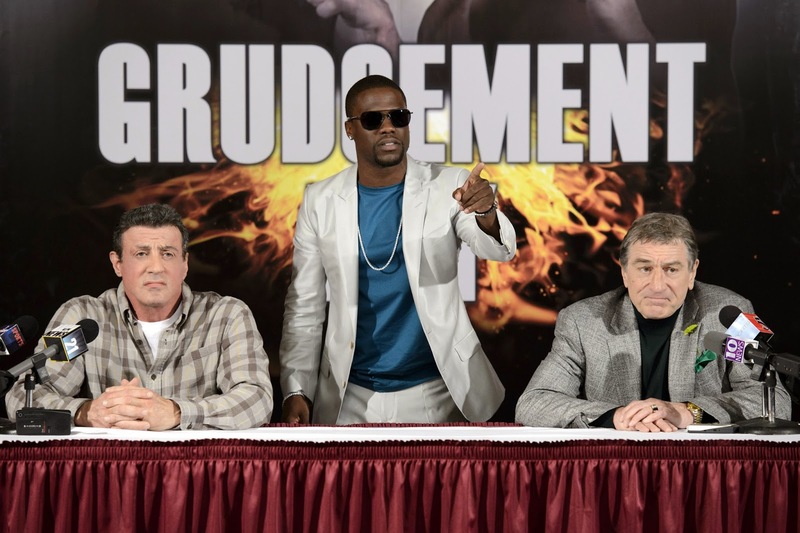 If there's anyone holding Grudge Match back from its real desire to be a family melodrama it's stand-up comedian Hart, whose particular brand of loudmouth, fast-talking comedy may have been brought in to lighten things up but feels like it belongs in another kind of movie altogether. Therein lies Grudge Match's biggest problem. It doesn't know whether it wants to be a Grumpy Old Men-style comedy set in the boxing world, or a geriatric version of Warrior. In the latter, the viewer becomes equally invested in its two fighters from a dramatic standpoint so that the inevitable match that ended the movie feels more high-stakes than usual. You get a bit of that in Grudge Match. But the miscasting of Hart betrays a lack of confidence in the inherent drama of the petty rivalry and its players. And the pile of contrivances it takes to get you to that final fight ultimately undermines what might have been a nice, small scale drama. 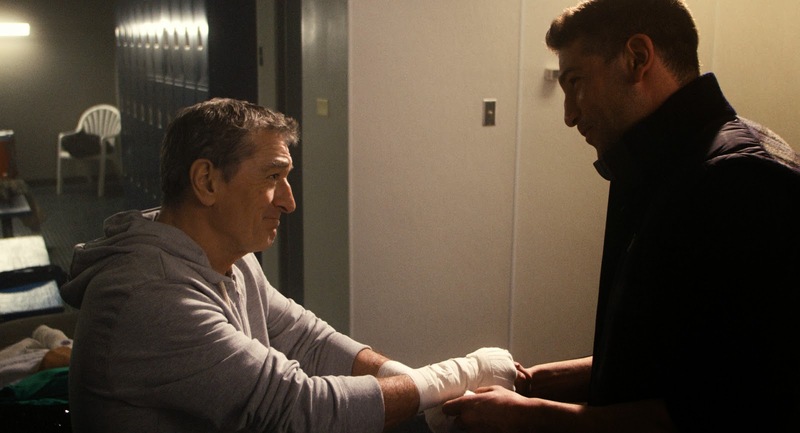 As it stands, Grudge Match is a well-intentioned alternative for moviegoers who don't really feel like catching something too challenging at the multiplex during their holiday vacations.